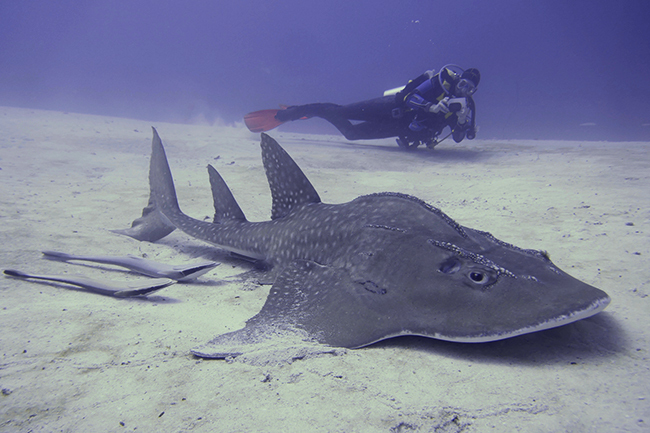 Planning some amazing, unusual and extraordinary dive adventures this year? 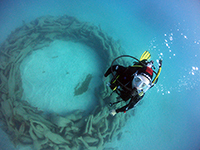 The best* 50 DIVE ADVENTURES will be chosen by a panel of AP staff from all those submitted. 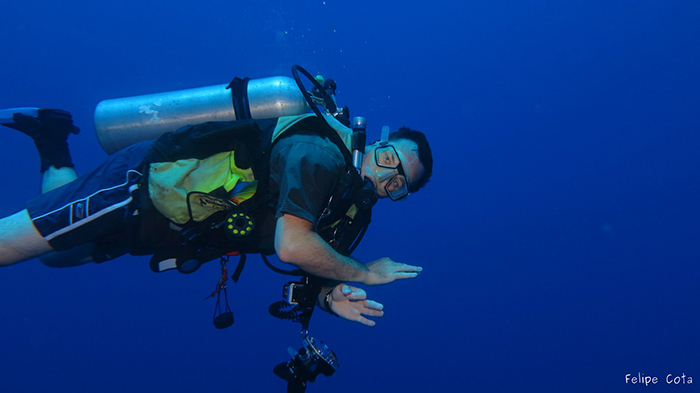 The top three best DIVE ADVENTURES (selected by the panel) will be entered into a random prize draw, which will take place in early December 2019. 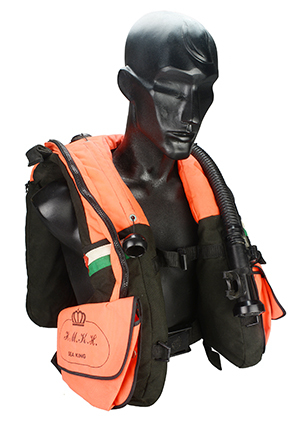 1st PRIZE: a brand new, full spec AP COMMANDO BCD (or other model of choice) and an AP SMBCi/35P - the original self-sealing Surface Marker Buoy with Easifil inflator. Plus AP goodies for the team: each diver taking part will be offered their choice of an AP Bamboo Thermos Flask, an AP Beanie or an AP Stylus Pen. Each diver in the team will also receive an AP 50th Anniversary Coffee Mug. 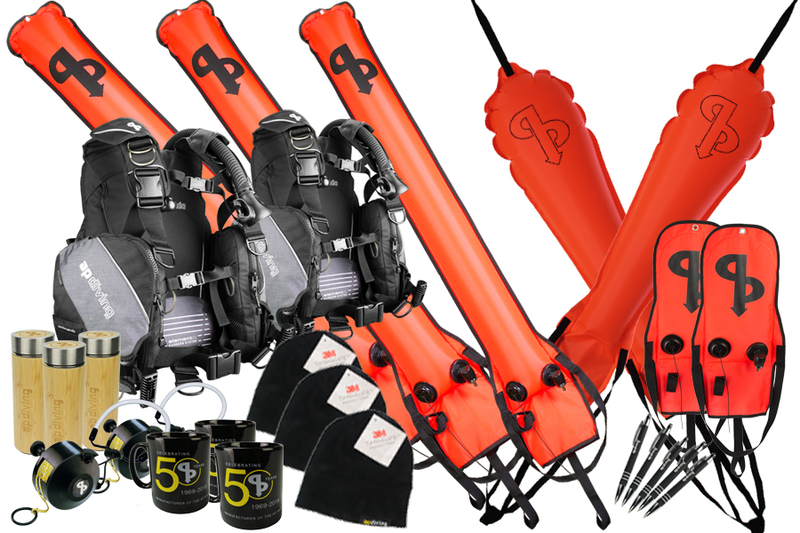 2 x Runners-up PRIZES: an AP SMBCi/35P - Surface Marker Buoy with Easifil inflator; an AP Pocket Reel; and an LB25C - self-sealing 25kg Lift Bag. Plus AP goodies for the team: each diver taking part will be offered their choice of an AP Bamboo Thermos Flask, an AP Beanie or an AP Stylus Pen. Each diver in the team will also receive an AP 50th Anniversary Coffee Mug. 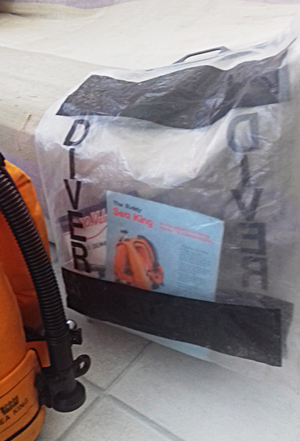 The next 47 best DIVE ADVENTURES (chosen by the same panel of AP staff) will win a prize of an AP SMBCi - the original self-sealing Surface Marker Buoy and an AP 50th Anniversary Coffee Mug. 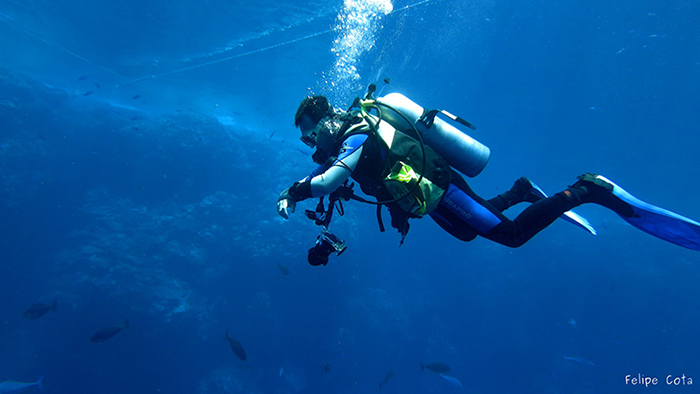 Every DIVE ADVENTURE submitted will be posted online on the AP website and all over our social media channels gaining publicity, kudos and out-reach for your club or group. If you are also posting your report on your own social media, it would great if you could use #AP50THC in the text? That way we get to collect all the good stuff in one place. Cheers. The panel will make their decisions, conduct the random prize draw and announce the results on or shortly after Monday 16th December. Prizes will be shipped asap after that, if possible before the end of 2019. This challenge goes out to you. What we are aiming for is 50+ beaches in total by the end of the year. Sign up your club and commit to cleaning one local beach and we should do it easily. Obviously, the solutions to the problems caused by "8 million tonnes of plastic being dumped in our seas every year" (source: BBC - Drowning In Plastic 2018) will not be solved by Beach Cleans alone. It requires long-term collective action from governments and organisations much higher up the food chain than us. However, we believe in leading by example and making a start locally. I'm pretty sure many divers will agree with this and are also uniquely placed to help out, having all the necessary gear, knowledge and organisational skills available. I'm thinking in particular of access to RHIBs or paddle-boards, together with unique sea-craft skills and local knowledge which would allow you to reach the beaches that the general public just can't get to. Risk Assessments - templates and checklists are available from the links above. 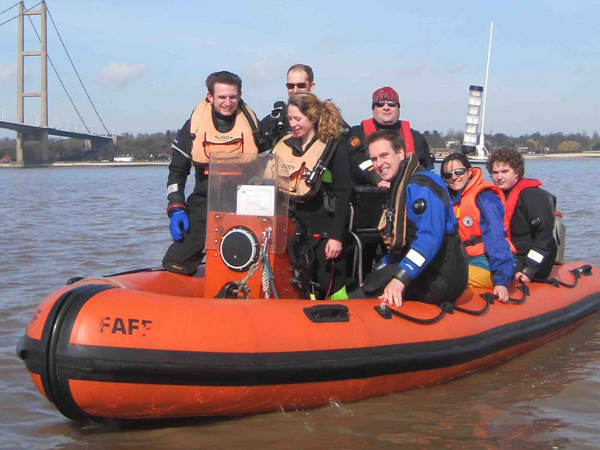 Health & Safety - equipment, tide times, marshalling, sign-in sheets, first-aid etc. Safety guidelines are available from the links above. Preferably register your plan with someone like the MCS who also like to collect useful data on what you find. If you choose to clean an isolated beach with only sea-access then preferably you should also consult with local wildlife groups, the Coastguard and others well in advance of any such efforts to ensure both the safety of the divers and to make sure you don't disturb or endanger any wild-life that may live there. 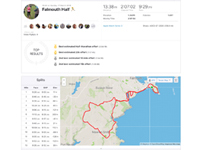 Or if you want to keep it simple, you could just join in with one of the regular organised events throughout the year by the likes of Surfers Against Sewage, the Marine Conservation Society or the National Trust. Helping to clean up the environment is obviously a reward in itself and it is another great out-reach opportunity to publicise and grow your club. 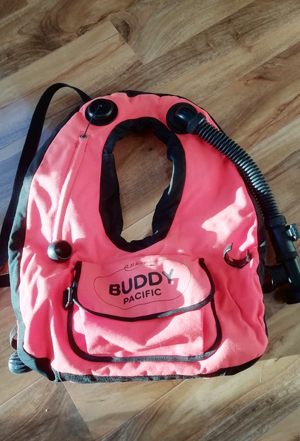 In addition, each Dive Club that submits a brief report and photos (50-200+ words or just photo captions) of their club's Beach Clean event will receive a prize from AP of an AP Training Surface Marker Buoy. We will also publicise each Beach Clean report on our web and social media channels throughout the year. Although it's not officially a competition, the AP judging panel will also choose what they consider to be the best effort of the 50 x Beach Cleans and extra AP goodies will be sent out in December. 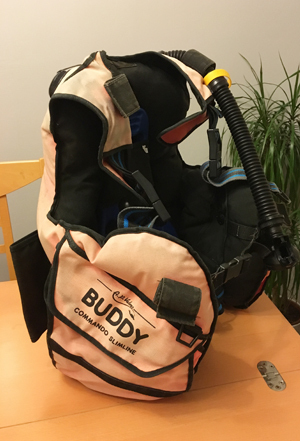 We are on the hunt for the oldest BUDDY BCD still going strong and maybe still in use in the water (or at least capable of being). 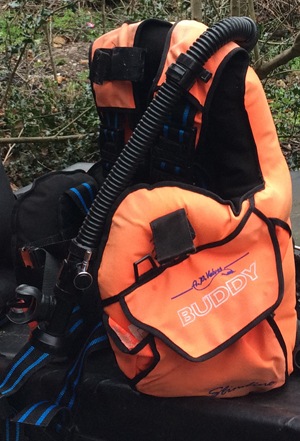 Divers are forever approaching us at Dive Shows saying "I've got a 25+ year old BUDDY Commando..." which is great! For them... they have definitely got their money's-worth... Not so much for us. "Time for a new one" we smile, hopefully. So we got to thinking... we should really try to find the oldest BUDDY out there. If you take a look at our history pages you will see that we made our first jacket back in 1974. 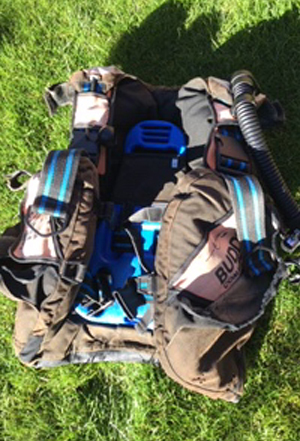 It would be great to find one of these single bladder "horse-collar" BCDs still diving? Ok, so the competition is simple: If you think you have the oldest, send us photographs (of it now and preferably, if possible, also back then, when you bought it) together with the serial number if you can find it (in one of the pockets) or any other evidence of date - receipt, warranty registration etc etc. If you want to give us any other information about your dive career at the same time that would be great. 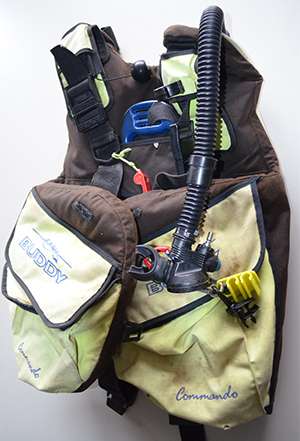 We will post the top 50 "oldest BCD" stories on this site and on our social media pages. If we have several BCDs which are obviously among the oldest but can't decisively be dated, then we will enter them (however many there are in this "oldest" group) into a finalists' Prize Draw lottery to make it fair. 1st PRIZE: a brand new, full spec AP COMMANDO BCD (or other model of choice) and in time-honoured AP tradition - a complimentary coffee mug! All of the runners up from the prize draw lottery will be sent the full set of AP goodies: an AP Bamboo Thermos Flask, an AP Beanie, an AP Pen and an AP 50th Anniversary Coffee Mug. All of the remaining 50 oldest BUDDY BCDs will all be sent 50th Anniversary Coffee Mugs. 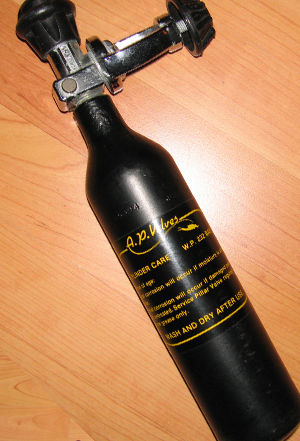 ...as we have found a pretty old one which we displayed at the last NEC Dive Show. Sent in by Allan and Bunny Colclough who used to run the Royal Dive School in Jordan. On retirement they were presented with the original 1986 BUDDY SEAKING jacket that belonged to King Hussein of Jordan. This 33 year old jacket is still in great condition and sets the target to beat. 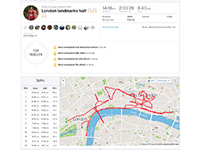 If you think you can beat that... please get in touch. That ABLJ was bought about 1985. I wish I had photos of my first from 1976 when I started. I still Dive AP with a Buddy Commando. 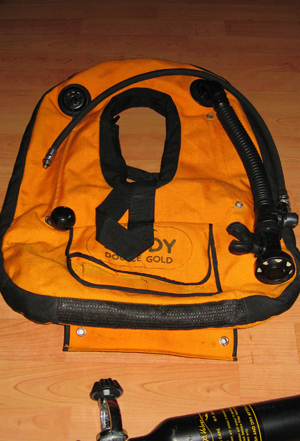 I started diving in 1987 with this Buddy horse collar style, then 1992 bought this Buddy Slimline which is fitted with the Auto Air. 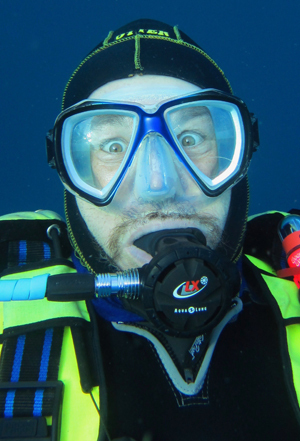 It's dived all around UK but these days warmer waters. 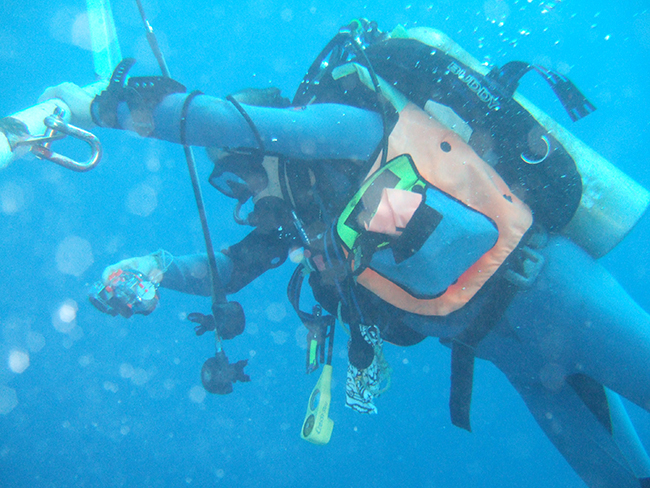 This time last year for two months I used it daily working on a damaged coral reef in Bali. 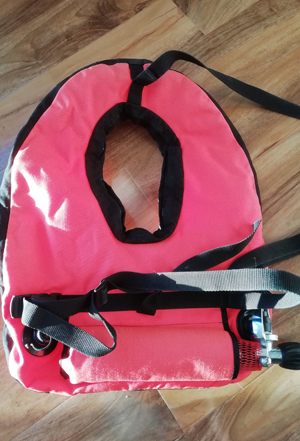 I've been ask to sell it by dive instructors abroad because it's very visible underwater and stands out from all the black ones you can buy these days. 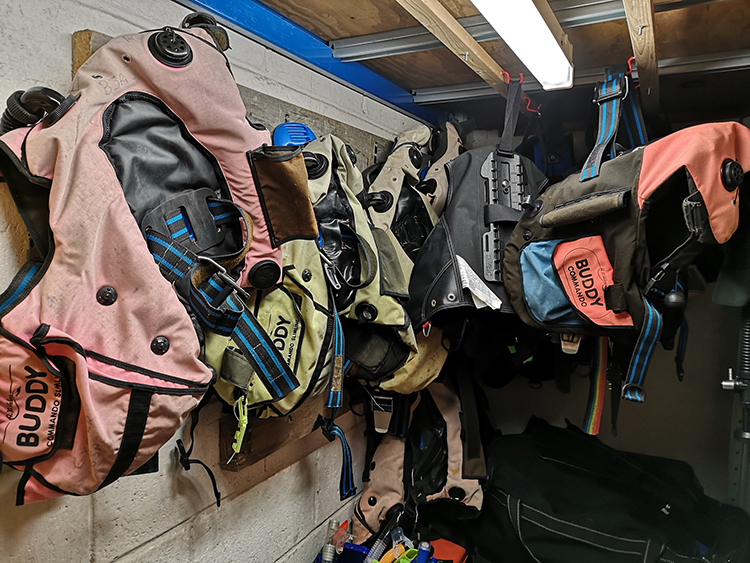 Here's a photo of Exeter BSAC kit room. 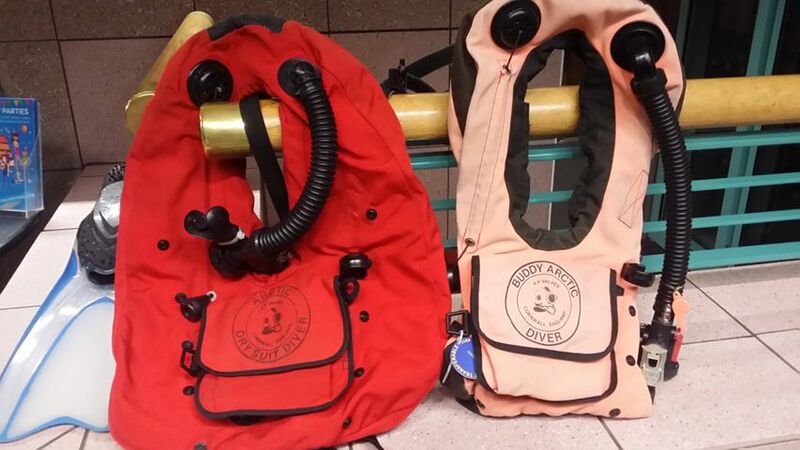 Whilst none of these BCD's are 50 years old, they've certainly had a hard life. [Above] is a photo of my Buddy Pacific. I know how old my Buddy Pacific is, for I've found the original 'crack' bottle, which is dated March 1988. 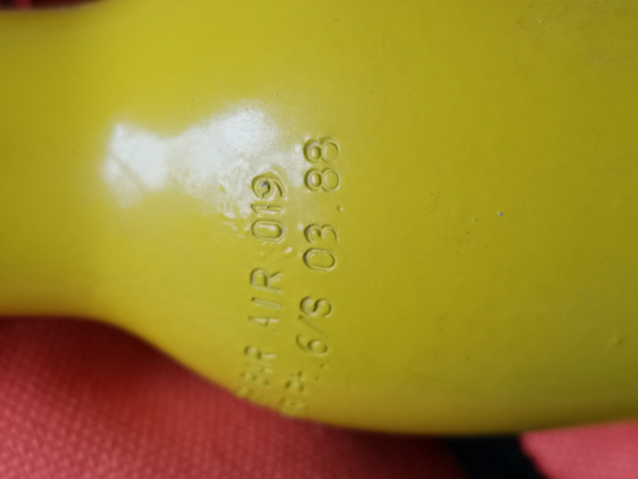 The BCD serial number is P8806123. 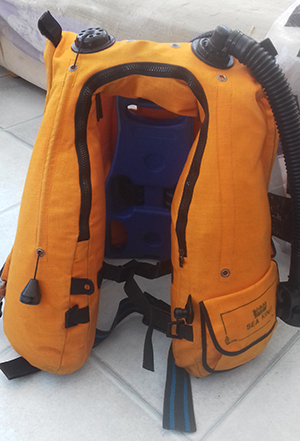 I bought the BCD second hand about 15 years ago, but put a more up to date bottle on it, because the original one looked 'quite tired'. Here's one in absolutely mint condition with the original cylinder. 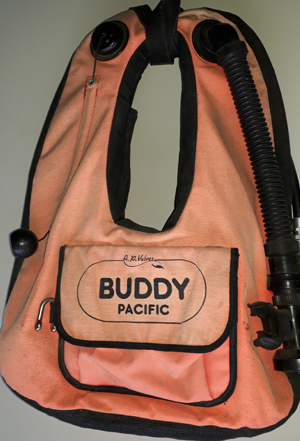 "I have an old Buddy Pacific ABLJ that I still use when I want to travel light. 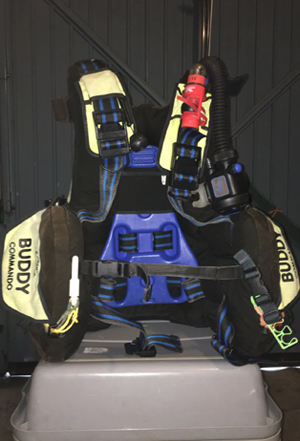 I also have 3 Buddy Commandos of varying ages with the newest model being used several times a month, the prior model accompanies me when I travel abroad and the oldest is kept for pool training and lending out to trainees of buddies when their kit is away for servicing. The attached picture was from last summer when my wife and I were away camping across the Western Isles and Ardmair, Ullapool (pictured) - I did not have much room for dive kit so my Buddy Pacific joined pony bottles and wetsuit kit to allow some shallow diving. 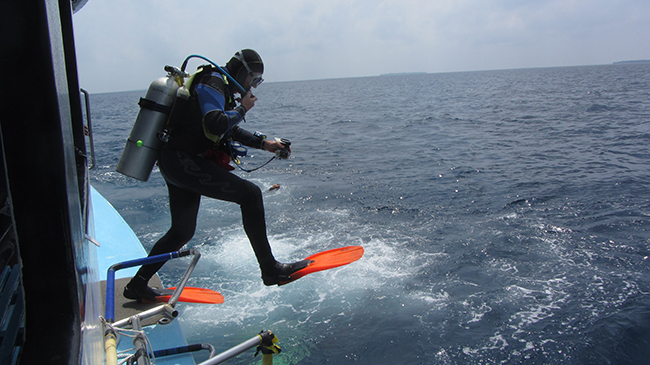 It also gets used when diving from my dive Kayak and for snorkelling. Keep up the good work guys, we appreciate your tough reliable equipment and great customer service. 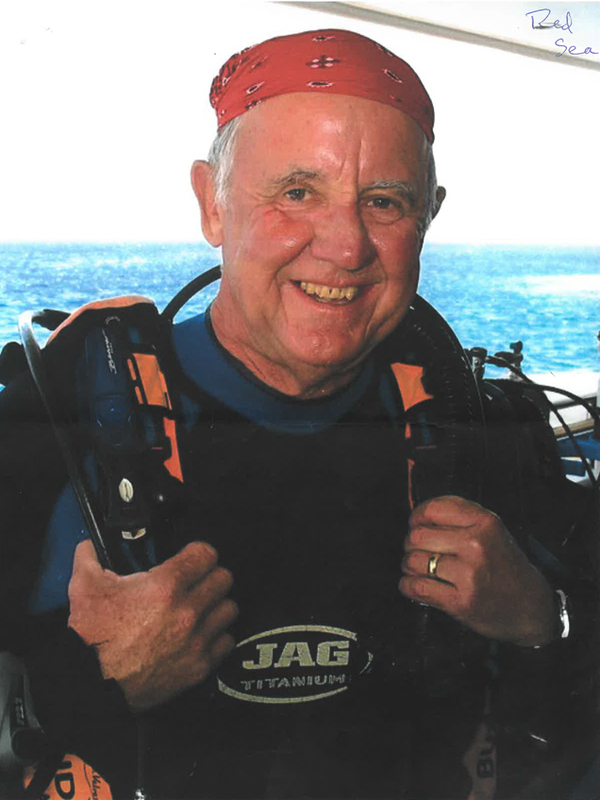 "I started diving in 1965 and I have dived every year since. I took up cave diving in the 1980's for a while but my wife got spooked by me doing it so I did less after 1990 (but didn't stop). Still diving. I cannot remember when I bought my Buddy Pacific ABLJ. Must have been in the late 70's. I know I bought it from Sandford and Down in Plymouth (the original Sandford and Down although they had moved to the Hoe area by then). My father was a regular customer of theirs. 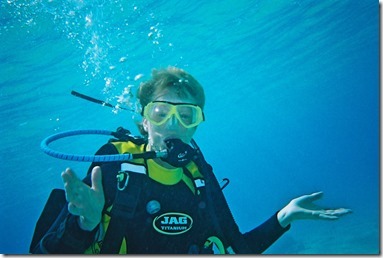 I can remember when asking for a life jacket (remember when we wore them with CO2 cylinders?) and they produced a Buddy Pacific ABLJ which apparently was very new at the time. 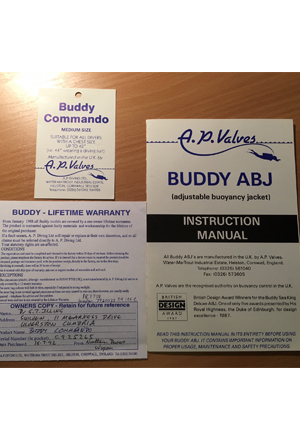 They gave me a good deal I remember (I was an impecunious junior doctor then) and I had it for years until I acquired a second hand Buddy Commando that have refurbished at least once and that I still use on diving holdays. 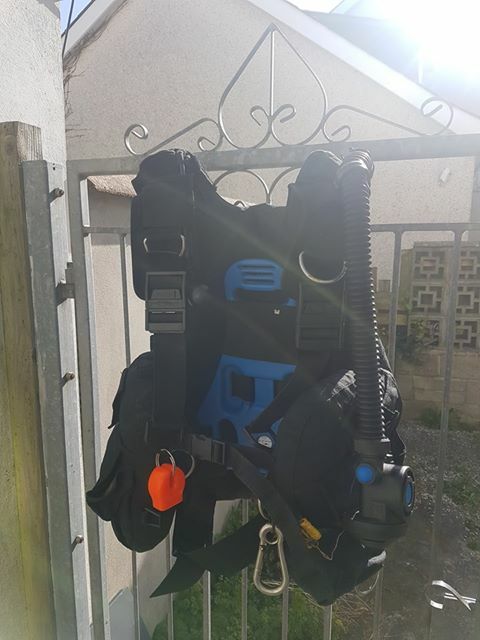 My daughters refused to use the ABLJ's when they started training having done it in the 90's when BCD's came in so the Pacific is sitting unused in my garage at present although fully functional. 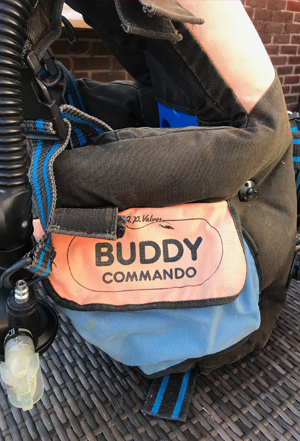 I have seen a Buddy Commando, orange in colour, so faded it was nearly white worn by dive leader in Madeira some years ago. You certainly make them to last and provide great after service. 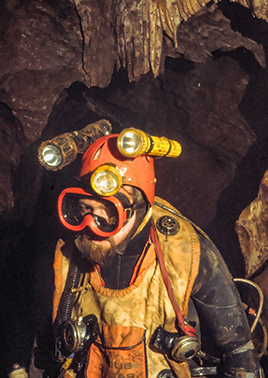 The Pacific has been on exploratory trips into Blue Holes in Bahamas and in the depths of the lake in Pridhamsleigh Cavern in Devon. It has never been the same colour since Prid as the cave is notoriously muddy. 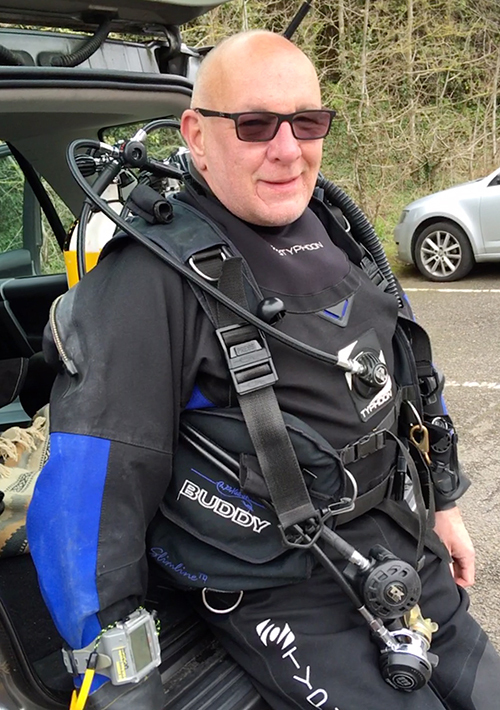 The picture is of my friend Brian Johnson preparing to dive in the lake wearing my ABLJ." 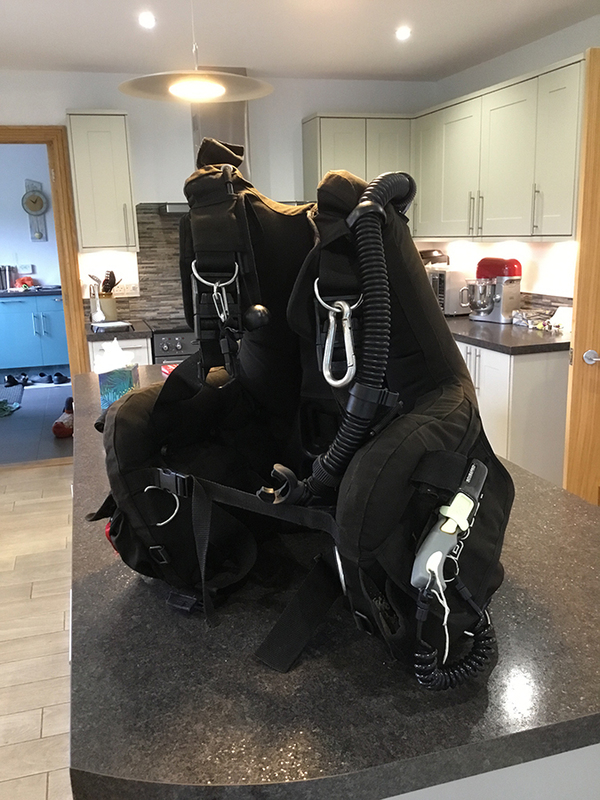 "Bought early nineties at Cornish diving, used extensively and reliably till naughties when I went to Dubai as a commercial diver. Recently used again after attic storage and it was great, apart from the cummerbund buckle which had become brittle and snapped. Thank you for the replacement. " "My buddy commando with cracker bottle.... still going strong !!! Worn [here] by Richie Harrison. 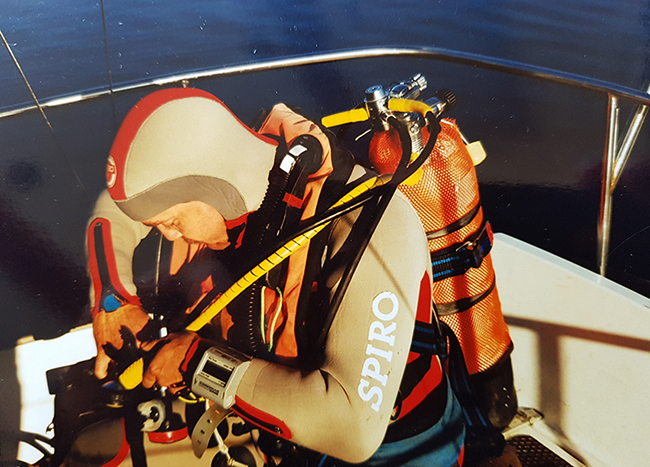 The jacket was purchased 1989/1990 initially owned by Bill Smith (rebreather diver from bluebird Project) I have used it ever since, bottle still functions perfectly. It has lived its life diving all the wrecks off the north east coast and is still my go to jacket if conditions are not great. 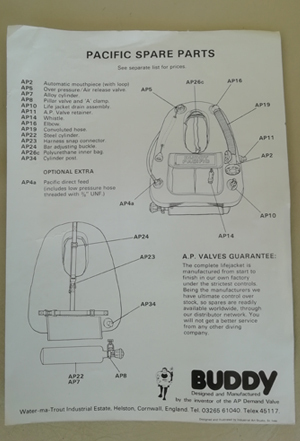 Absolute bomb proof equipment and a testament to your attention to detail. I will never get rid of this jacket. Thank you for the 50th coffee mug too ! " " This is me with my Buddy Arctic at St Abbs back in the day! I think it was purchased around 1986. 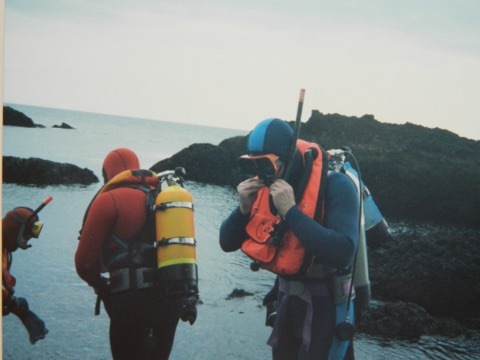 This photo was taken on a weekend trip to St Abbs with Chaumont BSAC in the summer of 1987." "I remember buying it with my dad at the Crystal Palace dive show from Tony Marshall of Collins and Chambers, I would guess in 1988. Can’t find the number in the pockets, seems to have worn off! Think I completed a registration form at the time, remember to a 16 year old it was hugely exciting. 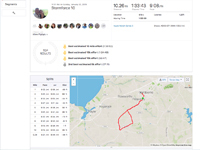 Still use for training purposes, I took the plunge and bought a new commando a couple of years back, love that too, prize possessions!" "We thought you might like to see a photo taken yesterday, 1st March 2019, of myself Gregg Sawbridge [on the right] and friend Ian Culmer. 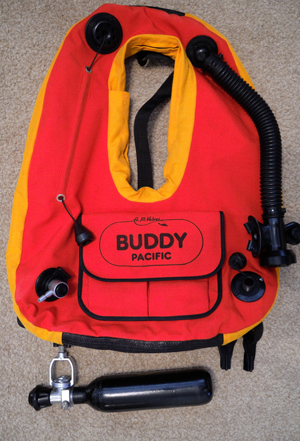 This is the ONLY dive kit we’ve used for the past 25+ years. 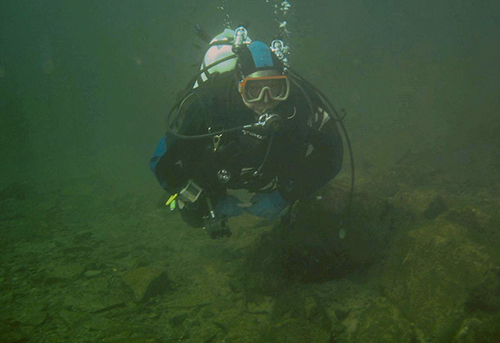 The photo is taken on one of our weekly trips to Stoney Cove." "[Here is] my Buddy Commando which when first purchased in the early 80’s was a loud orange!!! 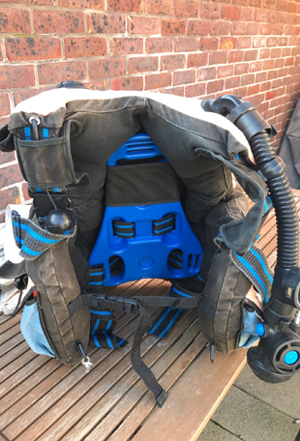 However, it still does the job both in open water and the pool, I first started diving in 1979 with the forces and this was my first ever purchase of a BCD and it’s still going strong, although like me has seen some adventures." "My trusty 'ole yella' is still doing me proud. second hand 15 years ago, it's seen me through some cracking adventures. It's a little like Triggers Broom, in that AP have replaced everything but the faded yellow canvas!" [via FaceBook] "Still have a few and they get used occasionally... 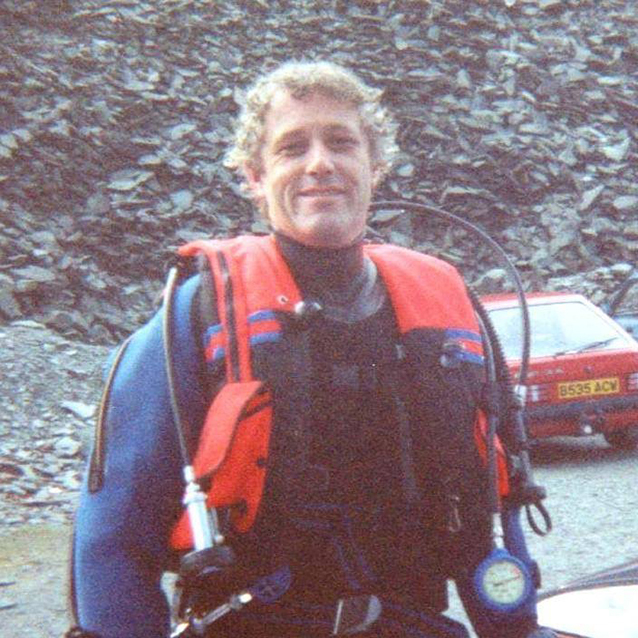 Here they are when they were new and we all had hair... "
[via FaceBook] "I've got a Sea King still going strong, mainly used for holiday diving and single tank training set up. It's had at least 3 owners and seen plenty of use. Shame you don't make orange kit anymore." 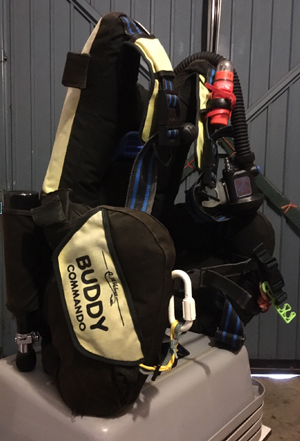 This won't be the oldest Buddy Commando Slimline but it been with me my whole diving career. Bought early 1990's. 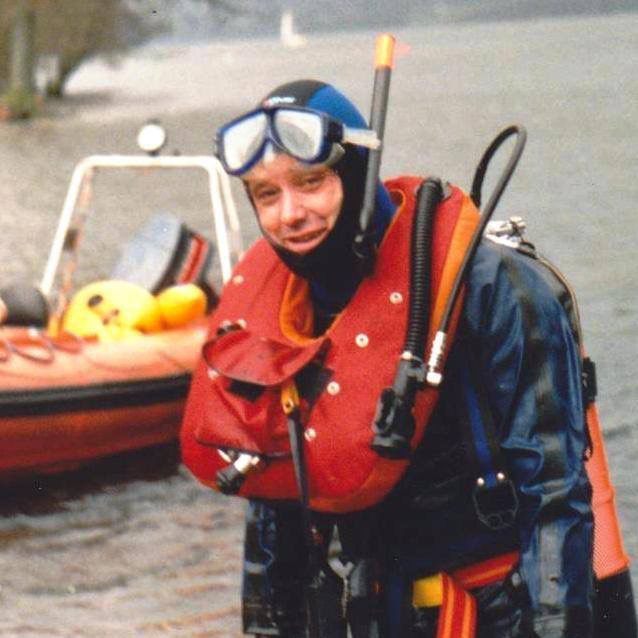 BSAC trained at UC Swansea 1990. 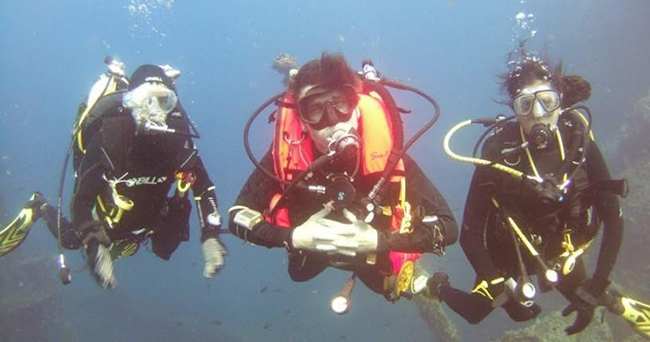 Loads of UK diving, then 2006 to 2011 full time instructing PADI in Phuket. It's orange colour ensured people asked me about it everyday! Its still going strong, its been back to AP just the once, for one minor reinforcement in the neck. It's got an easier life now as I also use a AP Tekwing Lite. 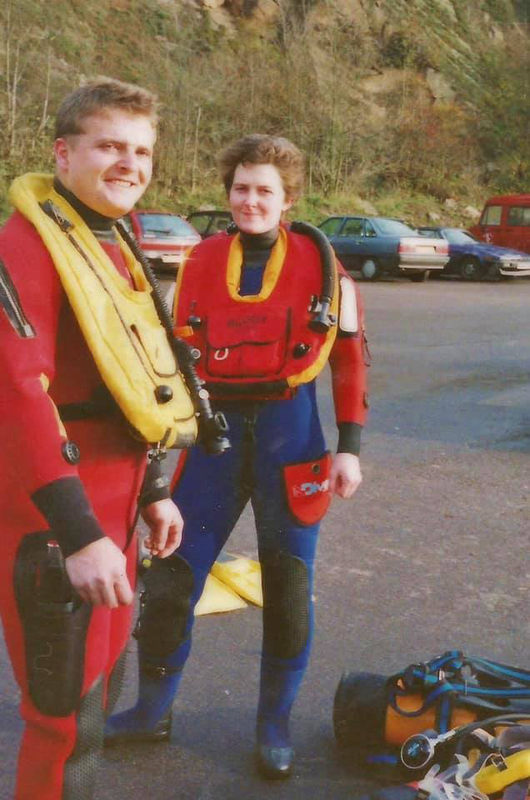 Speaking to my diving friend Kas at our Monday training evening she brought to my attention your 50 year old challenge of finding old but working ABLJ's and Stab Jackets. 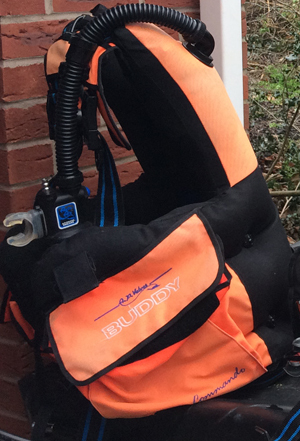 Sue has the Buddy Slimline, serial number 089433130, bought new by us on 16th June 1995 from SDS Diving Sheffield. We still have the receipt showing a purchase price of £269.00 plus £5.00 P&P! My Buddy Commando serial number (very faint) 942052, bought secondhand from a diving club member who unfortunately gave up diving for health reasons about 1995 / 1996. It was in 'as new' condition when I bought it. 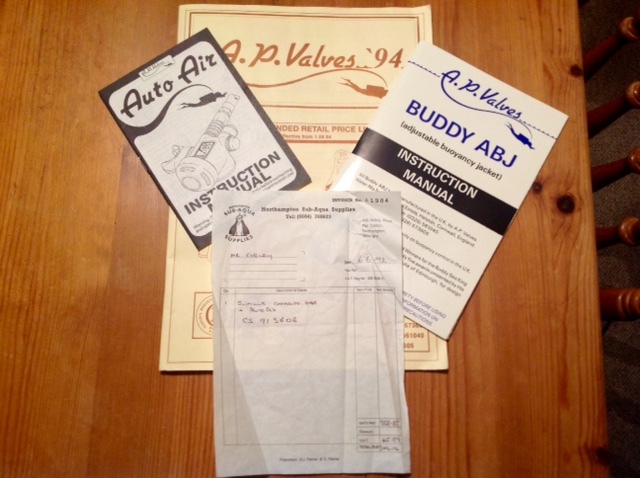 The Buddy Artic serial number A884220 was bought new by us in 1988, we cannot remember from where and we have lost the receipt over several house moves! It is in super condition, the colour has not faded from the vibrant red as supplied, the dump valves are still perfect as well as the mouth piece. 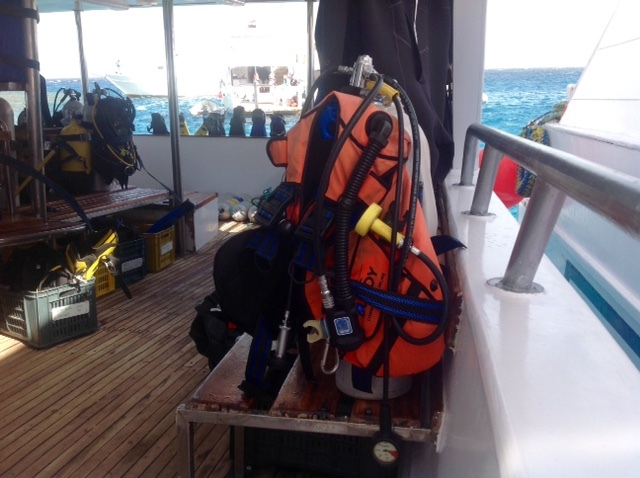 Both the Stab Jackets are used regularly by Sue and I, about 8-10 dives per year and are faultless. 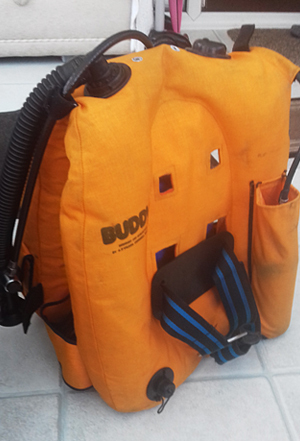 The Buddy Artic is in full working order and could be used for diving. 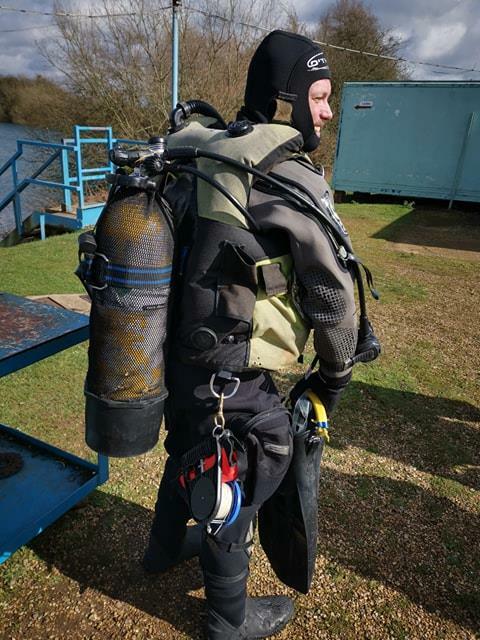 It is however used at our dive club 'Skill Nights' where some of our recent or young divers have never seen or heard of an ABLJ ! The challenge we set for our members is to swim a length of the pool under water by balancing the air put into the jacket to breath off and not too much causing the swimmer to surface. Great fun and enjoyed by all taking part. Should you require any further information on these great pieces of kit please do not hesitate to ask. Sue and I hope your 50th Anniversary Year goes well for you all at AP Valves. I can’t find a date on my wife’s BC but I don’t think they come in pink anymore?! I still use my old commando as well…..
Thanx in advance for the nice mug. 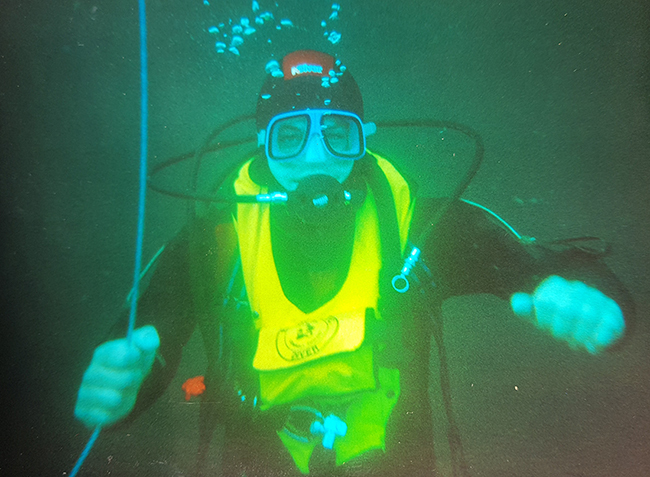 I was diving with a club called Amsterdamse Sport Duikers. 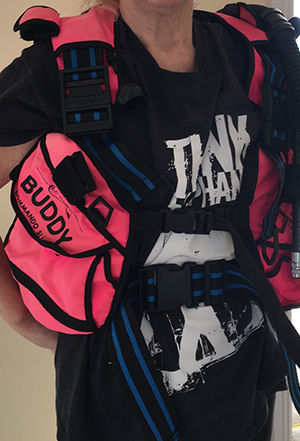 I came a lot to Shadow Diving [dive shop] and bought their first new BUDDY. Now I still dive with a BUDDY. 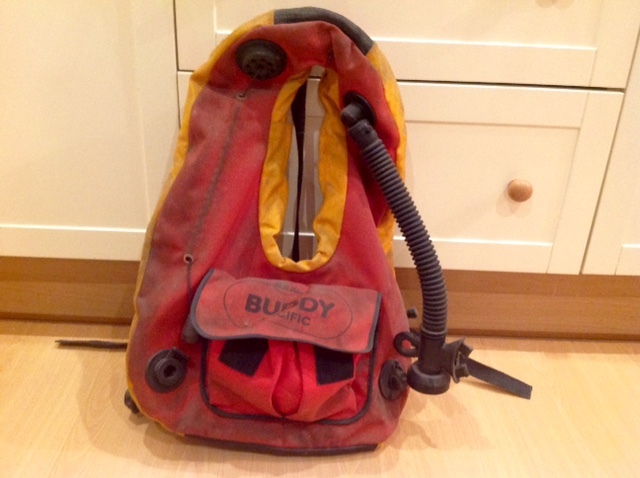 "Here are photos of my husbands ( Mr Andy Collins ) Buddy Sea King which he has had since 1985. 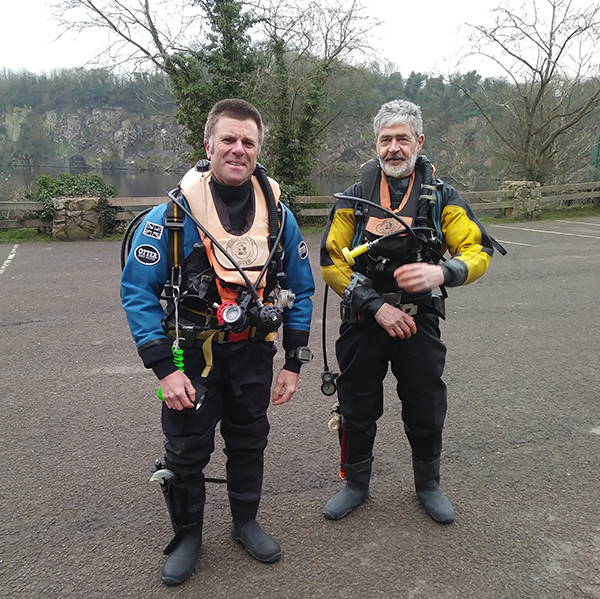 At 65yrs he manages a dive at least once a month with his 81yr old mate. Good luck with the 50 yrs Celebrations." "...I bought it from Mr Parker (directly) at The Dive Show in Birmingham about 1993." 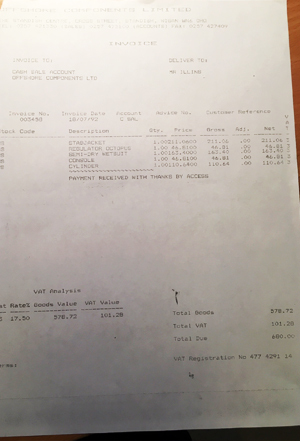 "Probably not the oldest by far, purchased summer 98, I still have the original receipt. 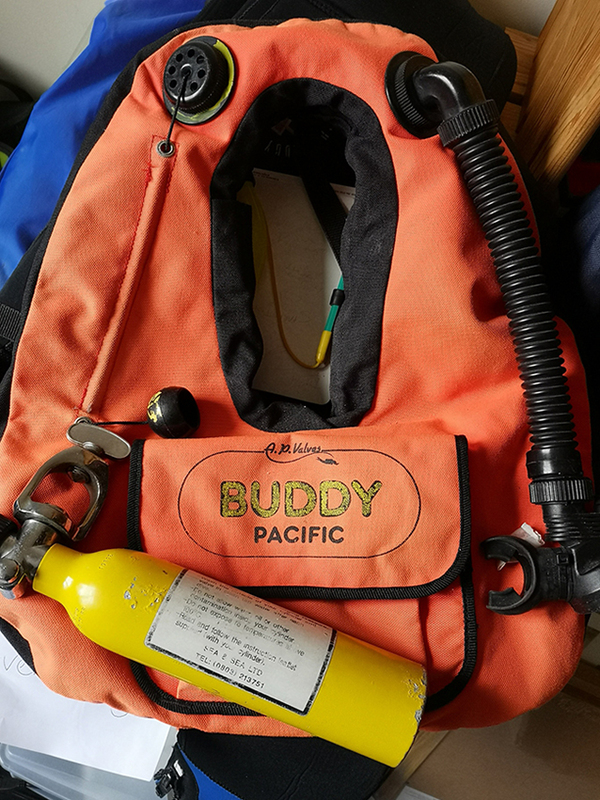 This old friend has had the pleasure of diving in the UK, Scotland, Scilly, Egypt, Bonaire, Cayman, Grenada, St Lucia, Tobago, Truk, Yapp, Poor Knights NZ, Thailand, N Sulawesi, & Misool. Despite all its travels it has never let me down or been damaged by baggage handlers." Congratulations to AP Diving on their 50th Anniversary. 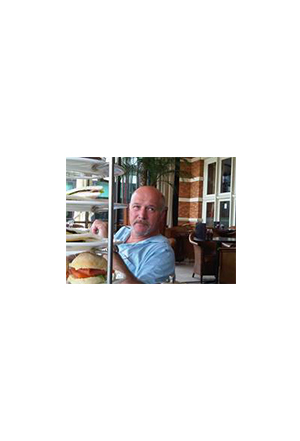 I have had great service from the company over the years, many thanks. 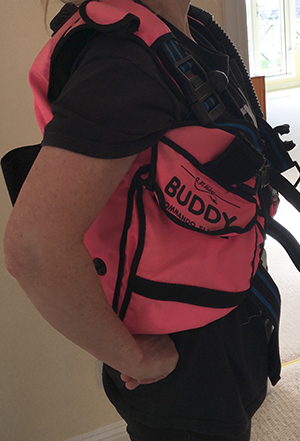 I have a bid for one of the 50 Oldest Buddy BCDs Challenge. 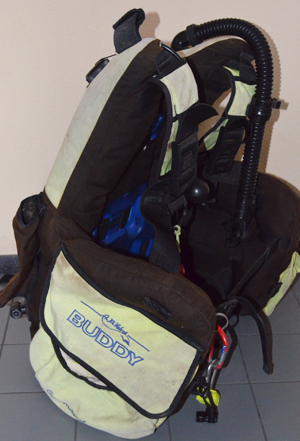 I bought my Buddy Commando on 18th July 1992 and have done approximately 740 dives with it since. 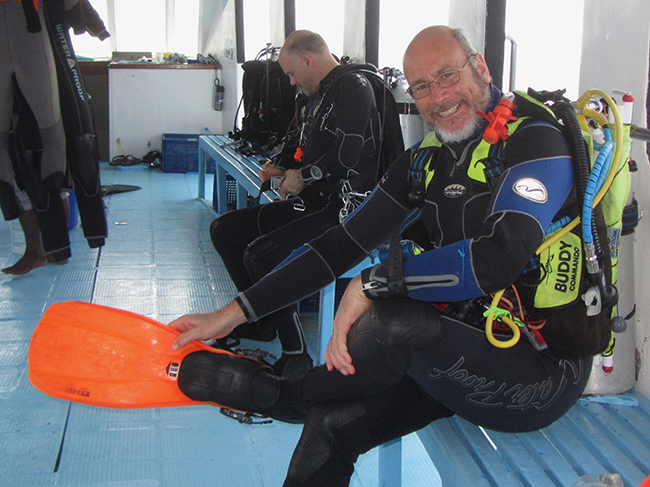 I learned to dive in Lake Coniston with Dalton BSAC and have dived actively in Scotland with Montrose BSAC, and abroad eg Bali, Cuba, Djibouti, Egypt, Jordan, Maldives, Oman. This year I’ve just returned from a trip to the Maldives (see above) and the jacket will be accompanying me to the Galapagos in August! 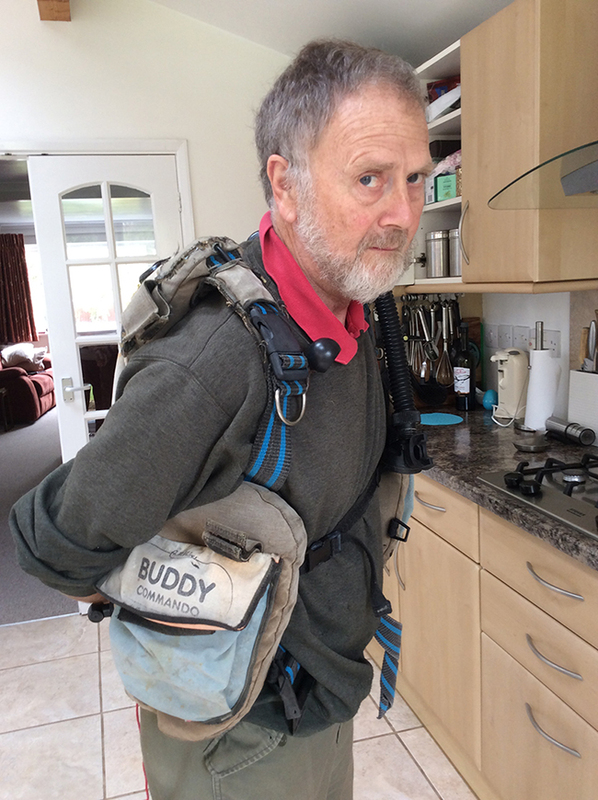 Hi Jeff, A couple of photos of the Buddy Arctic in action. 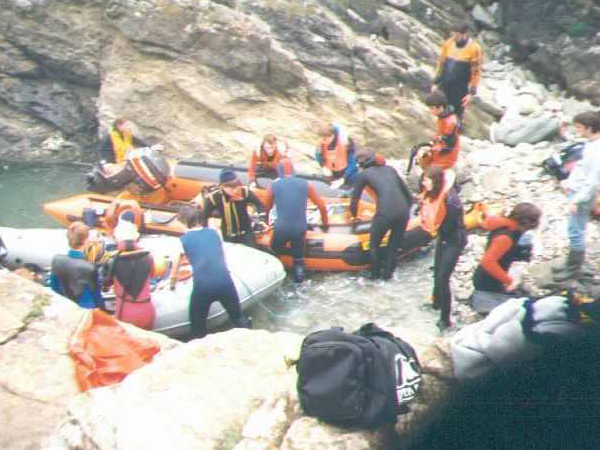 The one taken of me standing in the RIB was late 80's, the others 90's. The all orange Arctic I still use dates from 1988-9 I think. 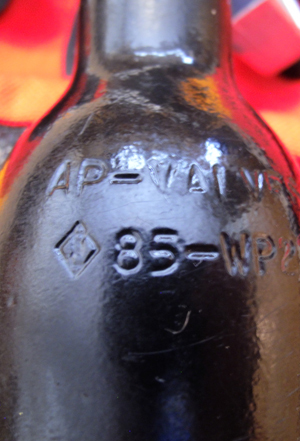 The original cylinder which came with that one was dated 1988. 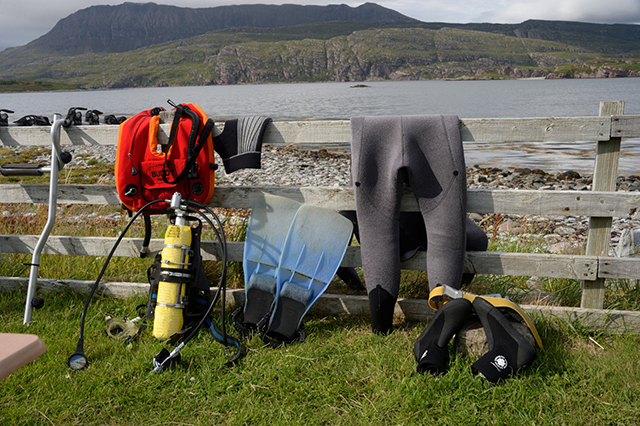 I found the Arctic comfortable and non restrictive when drysuit diving. You also had a robust lifejacket when back in the boat. 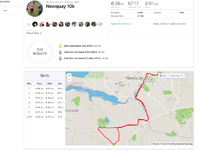 "I regularly enter Divernet’s competitions and had just entered one for a u/w photography book when minutes later I got a call saying I had won that month’s competition. I thought that’s quick and said I was looking forward to reading the book when the voice on the other end told me I’d won the Buddy Commando from the previous month’s AP Diving prize draw. 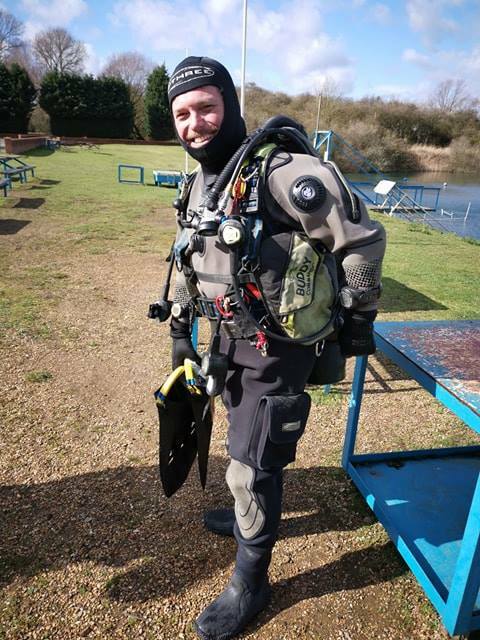 As it happens my girlfriend (Beth Lindsay) was just starting her Club Diver course so being noble and wanting mega brownie points I got the Commando in her size. This was in 2002 and it’s been used every year since and although it’s not very ancient, I’ll bet it’s the oldest prize Buddy Commando"
Attached is a picture of my (custom made) Commando, Serial number 883433 in use wrapped around little old me in Chuuk, Jan this year. 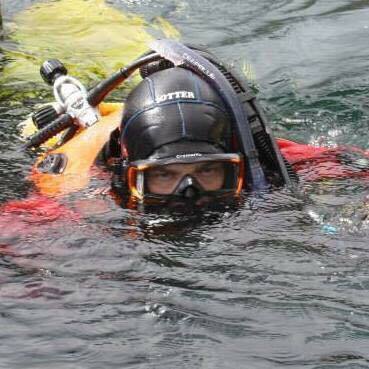 In use with a 'Redwing' as we dived with Twin's. 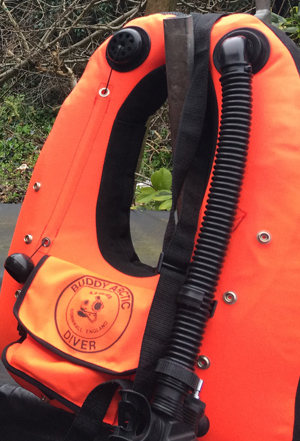 Ordered and bought through Wendy at 'Old Mill Diving Centre' in Clanstadwell, Milford Haven, Pembrokeshire. 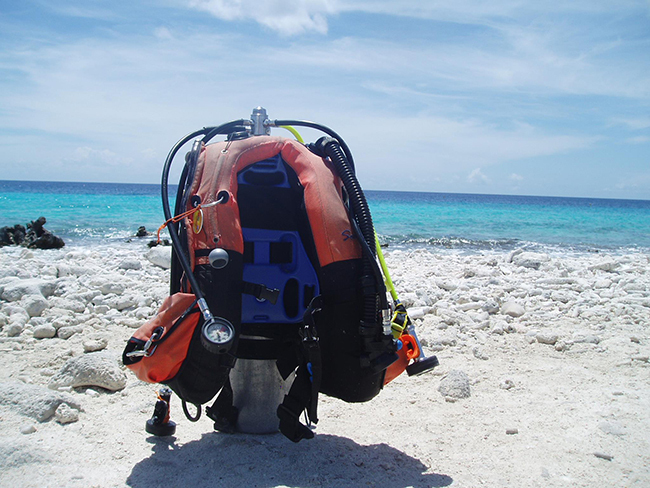 It's been diving with me or Gill (the wife) in the Med, (Malta, Cyprus, Turkey, Greece, Gibraltar, Spain; Island, Portugal, Canary isles and Madeira; Grenada and Cuba; Bali, Chuuk (truk); New Mexico & Colorado. Not the oldest, first used August 1987, but probably the most knackered! 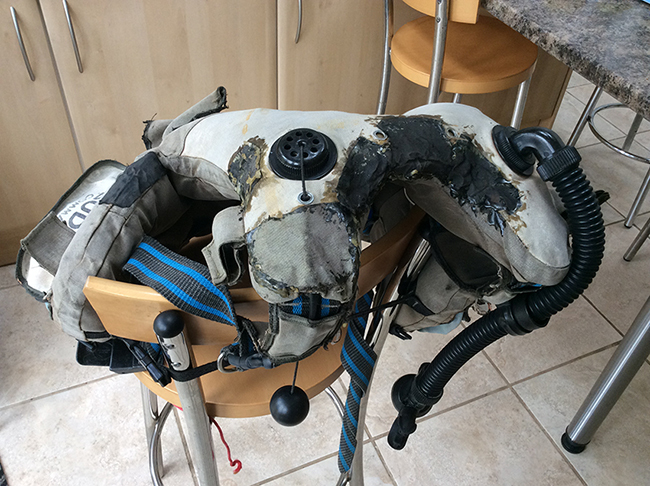 Still works fine in the pool; I gave up using it in the sea as I was getting flack about the condition even when I told people that the bladder was fine and the outside just cosmetic. Now use weight integrated Commando as my back has not lasted as well as the jacket. 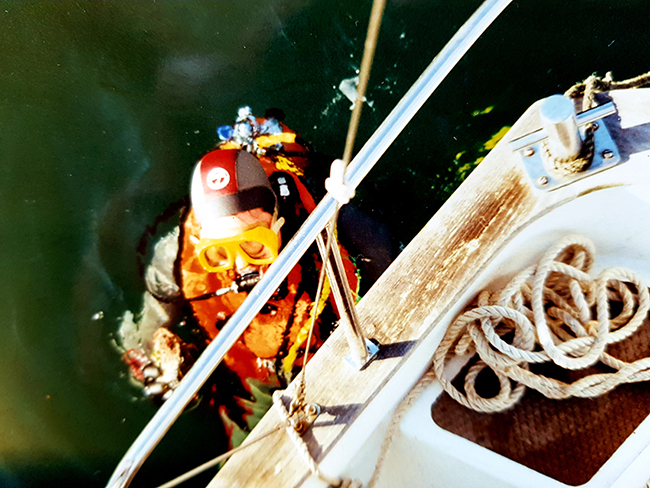 Hello, I bought the BCD in Cyprus in 1988 from Octopus Diving in Larnaca when I was stationed there as Royal Navy working with the Army... While not the oldest you may find, it is old and still in use regularly when I go to the Red Sea on my liveaboard trips. Thought I would include it in your competition as it is with you for servicing. This original BUDDY Seaking is a unique one-off build, made in 1986 for King Hussein of Jordan. 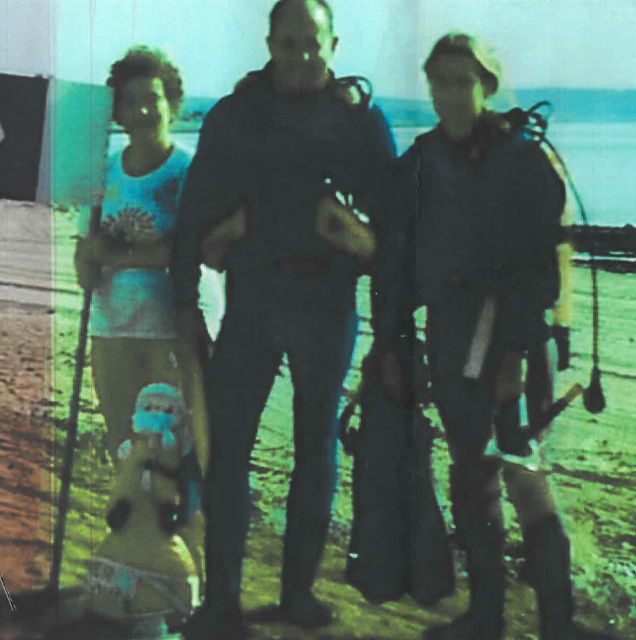 It was presented to him at the opening of the Royal Diving Centre at Aqaba in Jordan by the centre's managers and former Midlands Regional BSAC Instructors, Allan and Bunny Colclough. 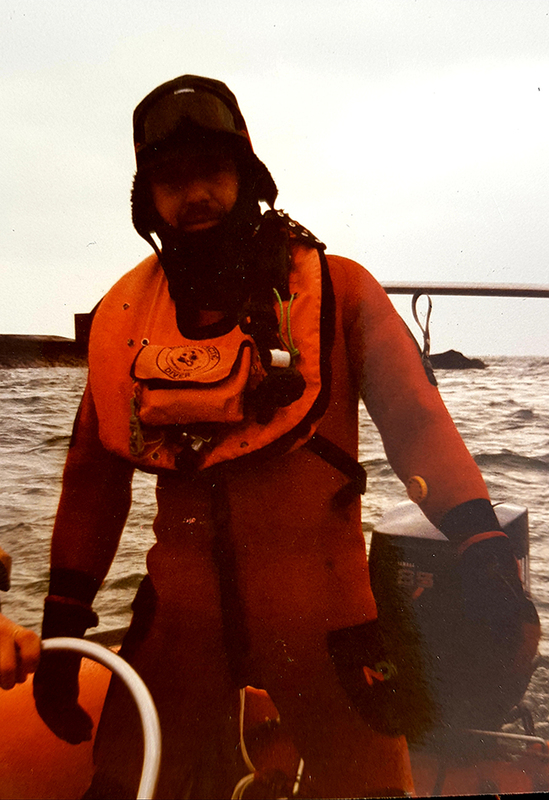 The Seaking found its way back to us in September 2018 thanks to Allan and Bunny's kind offer of returning the jacket to Cornwall after it was gifted to them on their retirement from the RDC. If you are also posting this on your own social media, it would great if you could use #AP50THC in the text? That way we get to collect all the good stuff in one place. Cheers. This one is for AP staff and just for fun. The challenge is for staff to come up with whatever individual or team challenge they want, diving or otherwise. The only criteria being - it must be a "challenge" - something that pushes them outside their comfort-zone, beyond what they would normally do. We have joggers, gig rowers, bakers, 10k runners, photographers, pilots, gardeners, horse-riders, classic vehicle restorers, singers, sailors, skiers, rugby players, half-marathon athletes, home-brewers, golfers, champion equestrians... to name but a few of the hobbies, interests and talents in the AP team. Oh, and quite a few of these are divers as well. 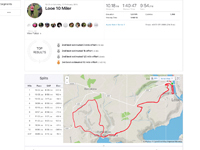 It will be great to see what they come up with as their personal 50th Challenge in 2019. Watch this space. 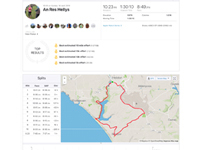 I will log the successful challenges as we go on this page and all over the AP social media pages. Hopefully we will make it to the 50 total by the end of the year.